Kudos to Adam Grimes for an excellent post on a most important topic: how to find trading ideas. The way I think of this topic is "how to find trading hypotheses". Once we have a hypothesis regarding an edge in financial markets, it remains for us to investigate that hypothesis and test whether or not it truly holds water and in which situations it may and may not be valid. One of the greatest challenges to developing trading ideas is limiting our initial search space. So, for example, we might look to charts for our ideas, or we might look to limited historical periods. 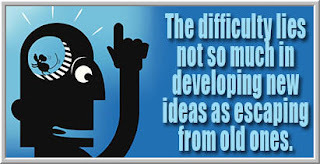 Very often, it's our old ideas that limit our ability to uncover new ones. Confirmation bias is a tricky thing: it's difficult to set aside our assumptions and truly look at markets with fresh eyes. It's not enough to simply look at lots of markets and settle on seemingly recurring patterns as foundations for trading. With a large enough sample, we can find patterns that recur simply on a random basis. Does the presence of a pattern necessarily imply a causal efficacy to that pattern? Patterns are only promising to the degree to which they inform our understanding. We need to grasp, not just that a pattern exists, but why it is significant. When scientists notice regularities in nature, they seek to explain those, and they link their tentative explanations--their theories--to predictions that can be tested. As psychologist Kurt Lewin observed, there is nothing so practical as a good theory. It's when patterns make sense to us in a broader web of understanding that we develop the confidence to trade those patterns. Very, very often traders attempt to trade patterns without developing a deeper sense of understanding their significance. It's difficult to stay in noisy trades when you don't truly understand why you're in that trade to begin with.